OUT IN FORCE: During the joint agency operation, 67 heavy vehicles checks were conducted with authorities looking for traffic, fatigue and compliance breaches. OVER 440 vehicles and more than 100 vessels were checked as part of an operation targeting heavy vehicle and marine safety around Portland, Victoria, and Portland's coastline earlier this month. Victoria Police, including the Heavy Vehicle Unit, Operations Response Unit, Technology Enforcement Support Unit, Portland and Hamilton Highway Patrols and local Portland police, along with Australian Border Force (ABF), the Department of Home Affairs, Maritime Safety Victoria, Victorian Fisheries Authority and VicRoads were in involved in Operation Crossway between April 2-4. The purpose of the operation was to ensure heavy vehicle operators and associated companies are complying with the relevant road safety legislation, as well as ensuring the safety and security of the dock precinct was maintained through a range of cargo checks. During the operation, 67 heavy vehicles checks were conducted with authorities looking for traffic, fatigue and compliance breaches. Pleasingly no trucks were taken off the road, however, overall when including other vehicles checked 68 vehicles were found to be unroadworthy. Police conducted 221 preliminary breath tests and performed 72 preliminary oral fluid drug tests with no one found to be over the limit however one driver returned a positive roadside drug test. Authorities, using automatic number plate recognition (ANPR) technology, scanned over 12,500 vehicles during the three-day operation uncovering 70 unlicensed drivers, 22 unregistered vehicles and 75 vehicles of interest to the Sheriff's office. ABF officers and detector dogs were also on site carrying out checks of Maritime Security Identification Cards, assessing container security and integrity, and conducting risk assessments of containers departing the waterfront. Western Region Inspector Dave Reither said the heavy vehicle transport sector had a huge role to play in road safety in Victoria. "The majority of drivers and businesses take their safety responsibilities seriously, however a few don't and it's those drivers and operators that police are targeting,” he said. "The Portland dock precinct is one of the main hubs in the west of the state for heavy vehicle activity and so it's only natural that this would be an area of focus for all the agencies involved in Operation Crossway. "Previously we've seen an increase in the number of lives lost due to collisions involving heavy vehicles. "An unsafe truck, a driver willing to take unnecessary risks and an employer happy to engage in unsafe work practices puts an enormous amount of people in the community at risk. VicRoads Manager Transport Safety Services Metro Russell Greenland said heavy vehicle safety is key on our roads. "Our Transport Safety Services (TSS) team works closely with Victoria Police and Worksafe Victoria to monitor and improve the safety of all heavy vehicles. 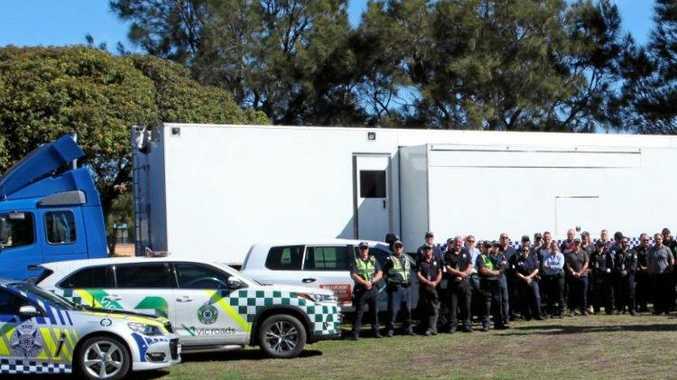 Our officers regularly patrol Victorian roads and carry out thorough inspections of vehicles to ensure they are complying with the law,” he said.